Tears express pain, agony and lonliness. Tears can express joy too. In totality, tears express our various emotions. Tears, well spent, removes the clouds of our mind, like the blue sky after a good rain. It allows the sun, which is our intellect, to peep through into life again. Once the tears are well spent, it is time to be real. After the rain, the sun must shine again. This is the law of nature. Sun has always been there. But, while the clouds of emotions obscured them, it remained invisible. Just be aware of that. When has an avatar left us? Has Lord Krishna existed from our plane of existence? He is very much here. Have Jesus, Buddha or Rama left us? Physical form has only represented expressions or experiences. It is temporary and situational. The truth that they conveyed is eternal. It is imperishable. This is the truth of our existence and this is the truth that we must know. Their religion has been Love. Teachings have been the same. Expressions were different, because the society they addressed had been different. Mostly, their own life was their teaching, more than verbal or literary teachings. This is also why, sometimes they and their teachings are mis-interpreted or mis-represented. So, no incarnation and none of their teachings have left our plane of existence. This is a fundamental truth. All Gurus are one. All masters are one. All appeared for a clear dharmic purpose of leading people towards liberation. All came to bring light into ignorance and associated darkness. All lived for the sake of others. For them, life and death are insignificant. Criticism or applause are insignificant. Out of many flowers that bloom in the tree of existence, some becomes fruits. Every flower will not become fruit. Only some walks the path till the end. Many fall off, during their journey of life. Gurus are compassionate. They allow the rise and fall disciples. They never impose anything. They allow their nature to express freely. Gurus continue to show light, whether they are in their body or not. The eternal principle of Guru (Guru Tattwa) eternally flows. Mind stuck in the past means agony in the present. Mind must travel with time, the present time. Mind must remain in the present and intellect should remain free and available. When intellect is locked up, tragedies happen in life. When emotions rule, tragedies take place. It is important to keep the mind with the body, in the present. All those who existed with us in the past has added value to our existence. We must be grateful towards them. Especially so, if it is an Avatar. An Avatar is eternal. It has no birth or death. It’s existence is purpose bound. 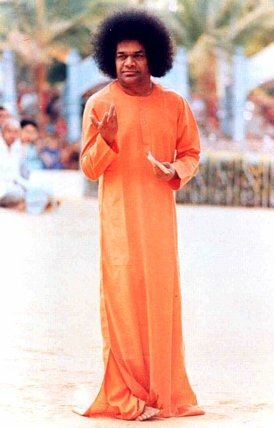 The best way to connect to an Avatar is to connect to His/Her teachings, consume it slowly, digest it properly and LIVE IT truthfully. A sadguru needs nothing from anyone. If their teachings are useful to generations, they are pleased. if they are not useful or understood, they are not sad. Everything is fine for a sadguru. They are never bound by their own image. Look at your past and all the people of past, including all those whom you considered as your Gurus, with gratitude and reverance. Remain in the present. Act in the present. Love those around you today and enjoy their presence in your life. Companionships are often temporary, just like relationships. Do not lose your present. Cherish your present. Enjoy every bit of it. Be grateful for every moment. Be grateful for everything. Do not lose focus on the present, including its people, by lingering in the past. All you have for yourself is your NOW. The sun must continue to shine. When sun fails, the earth and all its beings perish. When nature revolts, destruction happens. When our individual nature revolts, emotions wreak havoc and destruction happens in our individual life. We are well connected to nature. We are reflecting the nature. Think of the past with gratitude and not regret or guilt. Accept the present with gratitude. Act in the present using intellect. Honor the sadgurus of the past and present and LIVE their teachings. Then, their time on earth becomes worthwhile. No sadguru has left us. They live through their teachings. They live through those who lives their teachings. Gratitude…thats all you need. If you connect to their consciousness, through their teachings, you arrive at the hands of GOD.